It was on February 22, 2015, when I noticed a backhoe sitting in front of a bald eagles' nest near the Manassas, Virginia airport, that I wrote the following blog post. It went viral overnight. Five papers covered the story, including the Washington Post. None did any investigative reporting and concluded with statements from officials that everything was "fine." Prince William Times, at least, under the smart editorial leadership of Tara Donaldson, suggested that it was a bad idea to interfere with something so dear to the public in her article "Save the eagles--or yourselves." A year and a half later, a developer demolished the eagles' habitat within four feet of the base of the tree to erect two 40,000 sq. foot warehouses. They did so with no permit from U.S. Fish and Wildlife and no protections for the eagles--not even a sign at the base of the nesting tree to warn contractors and workers to not get too close. The eagles fled the nest during the work days and mostly only returned in the evening when work had subsided. It had clearly altered their sheltering and nesting habits from prior years. Concerned citizens, including myself, documented by photo and video each and every move made by the City, the developer and its contractors, and U.S. Fish and Wildlife. Even with repeated requests from residents via emails, phone calls, and direct messaging, the City constantly relented on putting any protections in place. It's been five months since ground was broken and there are still no signs up on the site to protect the nest from those who might get too close. And though we kindly asked both the City and developer many times, there is still no shielding in place to ward off the intensely bright warehouse lights that illuminate the nest every night. The eagles just can't seem to get a rest. 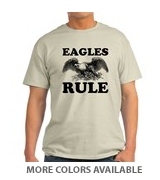 All of us that were deeply involved with the plight of these eagles also did our own research. We reached out to MANY organizations for assistance, but ultimately it came down to suing U.S. Fish and Wildlife. The outcome of that lawsuit is yet to be determined, and we anxiously await the court's response to make sure these eagles are protected. We also read many other stories from around the country where more citizens are fighting to protect our National Bird. Like the horrified neighbors in Virginia Beach who witnessed a homeowner tear down a tree with an eagles' nest without contacting Fish and Wildlife first. And the plight of the eagles in Norfolk, Virginia, where Fish and Wildlife shot paintballs at a male eagle so he wouldn't build a nest near the Norfolk Airport, even though the nest was not on airport property. That also went to court. It amazes me that after only 9 years since the bald eagle was removed from the Endangered Species List in 2007, there are so many stories of bald eagles being disturbed to no end. When someone like me, a nature filmmaker and photographer, never saw a bald eagle in the wild until I was 50 years old, that should tell you that their comeback isn't over. Most bald eagles reside in Alaska. It is my hope that this documentary will shed some light on these majestic birds and offer them better protections so that everyone will have the opportunity to view and enjoy them for decades and centuries to come. I hope you support our efforts.